It is one of those things, you have been in your house a while and you are starting to think right how do I add value to my house? You may love your house but you may also want to invest in the future. Easy ways to add value to your home. 1. Re-evaluate the space. If you knocked down a wall, You would have a huge open plan living area? Knocking down a wall might seem scary but it is one of the simplest things to make your home look and feel more modern. When looking at houses, we all look for that light and airy feel right? Let's face it, it is what is in vogue right? One of the most important things to do is to employ the best property refurbishment company, Make sure to do your research and check the company is well respected. A spokesman for a leading London property refurbish company says "All our workmanship is guaranteed, so nothing to worry about there. Have a look at our reviews on checkatrade.com". 2. What about adding a conservatory? 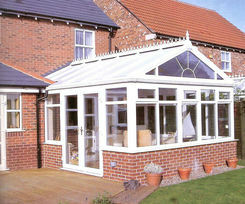 My Inlaws added a gable end conservatory and this sold their property in no time at all. Everyone who came to view the property told us that this was the major selling point in the house. It was so lovely. It really added that extra room to the house. The new owners actually use it as a kid playroom. I would never have thought of using it as that. My friend who has one uses her as her beauty salon. On my goodness having a massage in, there is like heaven on earth. I must book in any way I digress. 3. Change the interior door. Most people worry about there exterior doors but how often do you really look at them? whereas the doors in your house, you stare at all the time. Adding a door with glass panels can add extra light to any room. 4. The bathroom. Upgrade your bathroom. There is nothing I hate more than a bad shower. It's the first thing I check in any bathroom. I can change the rest of the house but a bad shower is a complete no for me. Or even worse old fashioned coloured bathroom suite No Just no. You don't have to spend the earth as you can buy a cheap bathroom suite. This will be zing back into a dull room. 5. Think storage. we all have lots of stuff where can you store it? What about having a new built-in cupboard or storage solution? Let's face it we all love clean lines and junk can make this hard work. but you would be surprised how easy a builder can come in an find ways to maximise storage and keep the same look and feel of your home. 6. Update your garden. When was the last time you actually thought about your garden? Other than wow what a mess. Unless you are a green-fingered goddess of course. I have never really looked at the garden until I was house shopping and I realised how important they are. What about adding some decking or build a stone BBQ? You honestly won't believe how much this will add to your home. I discounted some nice houses due to the garden needing work.